What's the scariest TV show you ever saw? Was it "Pigeons From Hell" or "The Hungry Glass" on Thriller? How about "The Howling Man" on The Twilight Zone? "I Kiss Your Shadow" on Bus Stop? The Twin Peaks episode when Laura Palmer's killer is finally revealed? How about an episode of The X-Files? Any discussion of the scariest TV episode ever should include "An Unlocked Window," a TV show that was first broadcast in 1965 and, more than 50 years later, still packs a wallop. I watched it recently with my wife and daughter late at night and there were quite a few shrieks and a promise afterward that they could not go to sleep right after watching that. The episode is based on a short story of the same name by Ethel Lina White (1876-1944), a British author known for her Gothic mysteries featuring domestic suspense and women in jeopardy. In addition to "An Unlocked Window," which has been adapted for television twice, she wrote many novels, including The Wheel Spins (1936), filmed by Alfred Hitchcock as The Lady Vanishes (1938), and Some Must Watch (1933), which was made into the 1946 film, The Spiral Staircase. Had she written nothing else, Ethel Lina White would be remembered as a master of suspense for these three works. 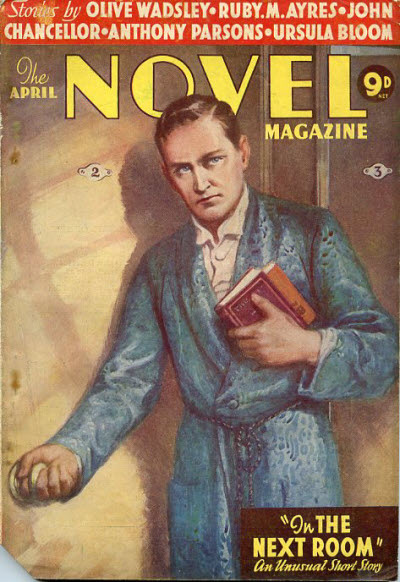 "An Unlocked Window" was first published in the April 1934 issue of The Novel Magazine, a British fiction magazine that ran from 1905 to 1937. As the story begins, we meet pretty, young nurse Stella Cherry, who has been hired to care for Professor Glendower Baker in his home. Injured by gas doing work of national importance, the professor is confined to his bed and requires a private duty nurse. However, Nurse Cherry forgot to screw the cap back on her patient's last cylinder of oxygen, so Mr. Iles, the handyman, has to take the pony for "the long drive over the mountains, in order to get a fresh supply." As he leaves, Iles warns Stella to lock every door and window. There is a nighttime storm outside, and after he departs she is left in the big country house with Baker, her patient; Mrs. Iles, the housekeeper; and Nurse Silver, an older woman who was brought to the house recently to help Nurse Cherry. Why did Iles say to lock the doors and windows? Three nurses in the area have been strangled recently and the police are searching for Sylvester Leek, a medical student who had a violent breakdown. Nurse Silver does not trust Nurse Cherry due to her mistake with the oxygen cylinder and comments that she thinks another murder is likely to happen soon. Nurse Cherry has another reason to worry about her patient: she has fallen in love with him and he has proposed marriage to her. In the meantime, Mrs. Iles has too much to drink and the two nurses put her to bed. Dr. Jones telephones to say that a fourth nurse has been found, strangled. Nurse Cherry tries to befriend Nurse Silver, but the older nurse is critical of the younger nurse and accuses her of leading her patient on romantically. They hear a knock at the door and Nurse Silver fears that the killer has arrived. Nurse Cherry goes upstairs to make sure that the rooms are empty, opens an attic window to let in some fresh air, and goes to check on her patient. He needs oxygen, so she tries to phone Dr. Jones, but the phone line is dead. Suddenly, Nurse Cherry remembers that she left open a window in the larder when she had been frightened by a mouse. On her way to the basement, she sees a man's footprint, still wet. Running upstairs, she hears a strange, male voice. She finds Nurse Silver, who has been drugged. Now alone in the house with a murderer, her patient in danger and the other two women essentially unconscious, she chooses to sit by Professor Baker as the hours pass. Around three a.m., she hears a man's footsteps in the next room. Rushing out to the landing, she sees Nurse Silver crush a mouse under her heel and Nurse Cherry realizes that Sylvester Leek murdered the real Nurse Silver and took her place. He emptied the oxygen tank, drugged Baker, and put Mrs. Iles to bed, all to eliminate any obstacles to killing Nurse Cherry. He cut the telephone line and refused to answer when someone knocked at the door--surely it had been Dr. Jones knocking. Entering the attic, unaware that his secret is known, Leek reaches to close the window that Nurse Cherry had left open and Nurse Cherry pushes him out. After he falls to his death, Nurse Cherry checks on her patient and then goes around the house, unlocking the doors and windows as dawn breaks. "An Unlocked Window" is an effective story of suspense, in which the young and innocent "Cherry" is menaced by the more mature "Silver." It benefits from its time and place: Iles must go by horse-drawn carriage at the beginning to get more oxygen and the house is lit by candlelight; it is located at a remote spot in the country, connected to the rest of the world by a thin telephone line that is easily cut. There are subtle clues along the way that Nurse Silver is a man: she has a "solid build" and "strong features," as well as "stout looks" and "tight shoes," suggesting that Leek stole the dead nurse's footwear and that it is a little too small for him. The moment of revelation comes when Nurse Cherry sees Nurse Silver stomp on a mouse; the implication is that a woman would run in fright from a small rodent, as Nurse Cherry did in the basement, while a man would kill it without hesitation. James Bridges does a brilliant job of adapting the story for television, adding scenes, fleshing out characters, and making a shocking change to the conclusion that renders the show one of the most terrifying ever broadcast. Premiering on NBC on Monday, February 15, 1965, the show begins like many of the adaptations by Bridges, with scenes that dramatize events that had already happened when the short story opens. The first scene features poor Cathie Merchant, who had been the murder victim in "The Star Juror" and who was sitting next to Riley McGrath when he shot Stoney Likens in "Return of Verge Likens." Playing Nurse Frieda Little, Merchant leaves the home of a patient and walks home after dark, followed by a sinister man whose face is not shown. There are many shadows and quick cuts back and forth between pursuer and pursued, with music heightening the tension; "You're such a pretty nurse," says the killer, and Frieda screams. We hear a sinister laugh, there is a cut to clouds obscuring the moon, with plucked strings and horns adding musical tension, and the scene dissolves to the exterior of the famous house from Psycho. 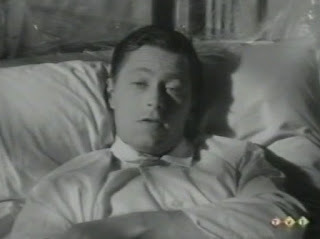 High wind is heard on the soundtrack and the scene cuts to an interior shot in the room of Glendon Baker, the patient, as Nurses Crosson (Cherry in the story) and Ames (Silver in the story) sit in chairs on either side of his bed, watching a television news report on the latest killing. Baker has an oxygen tent over him and appears fragile. This scene presents a rather awkward method of exposition, as the camera cuts back and forth from the picture on the TV set to the faces of the nurses watching. The purpose is to provide a quick summary of the murders and the room is dark but for the light from the TV screen; tree branches outside the window cast ominous shadows within the room. Other than one interesting camera move at the end of the scene, where the camera focuses on the TV screen before pulling back and swinging around without a cut to show the entire room, this is a static moment in an otherwise exciting show. 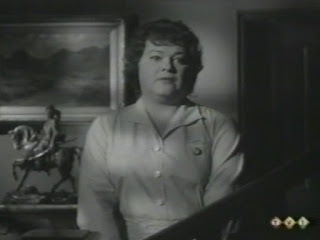 The character of Maude Isles (Mrs. Iles in the story) is much expanded in the teleplay and becomes a humorous chatterbox of the type often found in Hitchcock's films. "I read a book," she says, "about a man who only killed trombone players. He beat them to death with their own trombones." Maude provides some much-needed comedy relief in the episode until she passes out from having too much to drink. 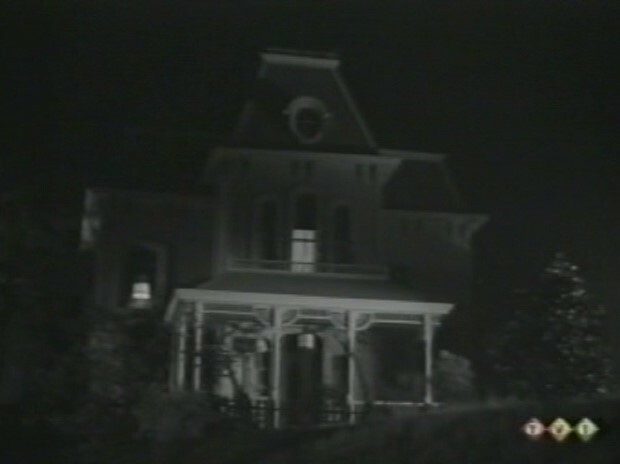 Her husband Sam, the handyman, heads off by car (not pony cart) to get the oxygen tank and, in another scene referred to in the story but dramatized on screen, Stella heads down to the cellar with a flashlight to make sure the windows are shut. She closes one but is distracted by a mouse and forgets to close the other. We see the open window and a shot of this window swinging open is repeated on and off throughout the show. 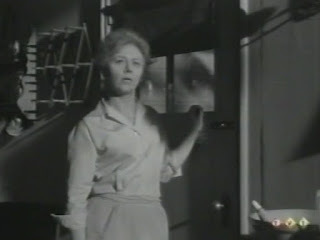 Initially, "An Unlocked Window" teases the viewer by providing little shocks that turn out to be nothing and are treated lightly and laughed off, such as when a door is suddenly opened and a character is surprised to find someone behind it. More humor is provided when the patient, Baker, talks about Maude's skill at strangling chickens to make soup. There is a nice camera angle looking up at Maude as she talks on the telephone; the angle allows us to see her, the staircase leading to the second floor, and the upper landing, all at once. The first act ends with a shot of the basement window swinging open and a musical sting with horns; similar shots will end the second and third acts as the show breaks for a commercial. The same musical phrase begins Act Two, over an exterior shot of the house; like the shots of the open window that end the first three acts, shots of the outside of the house occur after the initial murder and at the start of Acts Two, Three, and Four, establishing the location clearly. The thunderstorm has now begun and the doctor has just called to report the nearby murder of another nurse. Maude adds to the tension as she counts off the time between lightning strikes and thunder claps, but her darkly humorous tales of murderers come to a halt when she is sure that she saw something outside the window. It doesn't help matters that a stubborn tree branch keeps smacking against the window pane! Bridges also dramatizes Baker's proposal to Stella although, unlike the story, in which she thinks happily of her upcoming marriage, Stella on TV does not immediately say yes. Maude gets drunker as the storm rages on and we hear a man's voice say, "Such a pretty neck," echoing the words of the killer in the first scene. Is Maude imagining this because she's drunk, or is the killer really in the house? We won't know until the show's conclusion. The electricity goes out and Act Two ends with another shot of the basement window swinging open in the storm. In Act Three, the house is only lit by candles, as in the short story. Maude continues to drink and passes out, insisting that the killer is inside the house. When she is in bed, Maude again hears a man's laughter; she screams and the nurses give her a sedative. The killer telephones and Nurse Ames takes the call, telling Stella that the killer knows they are alone and will pay a visit that night. The final act begins as Nurse Ames calls the police and we see a man outside walking toward the house in the driving rain. Gus the cat scratches at the window of Baker's room; Stella lets him in and realizes that the cat got out because she left the basement window open. She heads down to the cellar and again we see the man approaching the house. As she closes the window, Stella sees the man's legs outside and screams. The phone is dead and there is a knock at the door. Nurse Ames directs Stella to go and sit with her patient. The man comes to the front door and Stella hears Nurse Ames scream. She goes out to investigate and sees the door wide open and a man's wet footprints in the front hall. Nurse Ames calls to Stella, who also hears a man's laughter. She finds Nurse Ames sitting on the floor in a corner, claiming that the killer tried to strangle her and is in the house. They see a man behind the front door and Stella throws a fireplace poker at the figure, which falls and is revealed to be the corpse of Sam Isles, the handyman who had gone out for the oxygen tank. Stella hears laughter again and sees Nurse Ames, who now speaks in a man's voice and is revealed to be the killer. Ames grabs Stella, who knocks his wig off and tears open his shirt, revealing a hairy chest. "You're such a pretty nurse," he tells her, and the camera fades to black as we realize the villain has won and is murdering Stella. For anyone who has read Ethel Lina White's short story, the ending to the TV version of "An Unlocked Window" comes as a shock. Rather than a happy ending, where the nurse in peril pushes the killer out a window to his death, we get a terrifying conclusion, where evil triumphs and the heroine is murdered. The effect is chilling and many elements of this episode will stay with the viewer long after the closing credits have rolled. The menacing laughter, the phrase "such a pretty neck" and, most of all, the revelation that the unlocked window of the title was a red herring and the killer was in the house all along. Norman Lloyd later revealed, in an interview, that Alfred Hitchcock suggested having Stella rip Nurse Ames's blouse open in the climactic struggle, just to make sure the audience could see that he is a man. In addition to the brilliant script by James Bridges, credit for the success of "An Unlocked Window" must go to the cast and crew, who realize it so effectively for the small screen. First in line is Joseph Newman (1909-2006), the director, who directed ten episodes of The Alfred Hitchcock Hour in all, including "The Gentleman Caller," "Beast in View," and "Dear Uncle George," all from scripts by James Bridges. Newman succeeds in building tension to a high level in the final moments of the show and in making sure that there is no hint at the true identity of Nurse Ames. The show is photographed in shadows by Stanley Cortez (1908-1997), who was born Stanley Krantz in New York City and who worked as a cinematographer from 1936 to 1977. 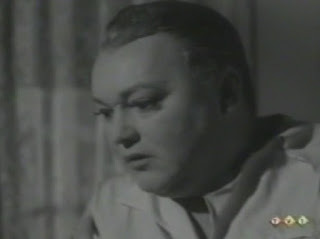 Among his films are The Magnificent Ambersons (1942) and Night of the Hunter (1955); he did not do much TV work and this is the only episode of the Hitchcock series he photographed. Bernard Herrmann (1911-1975) wrote the frightening musical score. This was one of 17 Hitchcock hours he scored; the last discussed here was "Where the Woodbine Twineth." The sound work on this episode is another important factor in its success, and it was engineered by Richard Tyler (1928-1990), who was nominated for four Academy Awards. 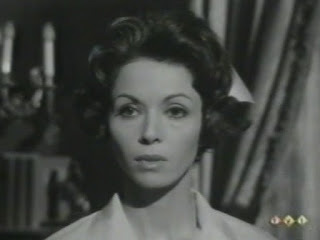 Leading the cast as Nurse Stella Crosson is Dana Wynter (1931-2011), a fine-boned actress born Dagmar Wynter in Berlin. She grew up in England and was on screen from 1951 to 1993; this was her only appearance on the Hitchcock show. She is best remembered for co-starring with Kevin McCarthy in Invasion of the Body Snatchers (1956). T.C. Jones (1920-1971) was a talented female impersonator who began this line of work in 1946. He was mostly a stage performer, though he appeared in a handful of movies and TV shows in the 1960s. His performance as Nurse Betty Ames is probably the most important role in "An Unlocked Window," since his ability to keep the audience from realizing that he is a man in disguise is the key to the entire mystery. Comedy relief is provided by Louise Latham (1922- ) as Maude Isles. 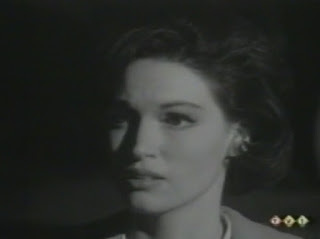 Latham has been on screen since 1961 and this was her only role on the Hitchcock series. She is best remembered for her first film role, as the dreadful mother of the title character in Alfred Hitchcock's Marnie (1964). Lying in bed for all of his scenes is John Kerr (1931-2013), who plays Baker, the patient. He was on screen from 1953 to 1992 and played Lt. Cable in the film version of South Pacific (1958). 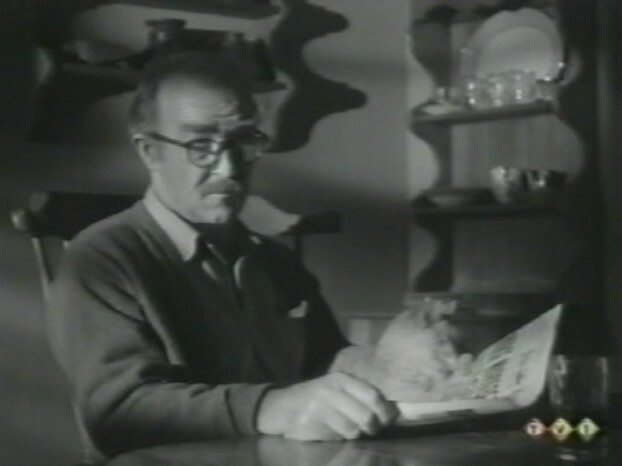 He also won a Tony in 1954 for his starring role in Tea and Sympathy. This was his only appearance on the Hitchcock show. Sam Isles, who appears at the beginning of the episode and then reappears at the end, is played by E.J. Andre (1908-1984), who had a three-decade career on screen and who also played the preacher at the funeral at the beginning of "Where the Woodbine Twineth." Finally, Cathie Merchant (1945-2013) is killed again in the first scene, just as she was in "The Star Juror"! Only nineteen years old, this was one of her four appearances on The Alfred Hitchcock Hour. The cast and crew of the 1965 version of "An Unlocked Window" did a masterful job of bringing Ethel Lina White's story to life for television. A less successful translation came in 1985, when the show was remade as the fourth and final segment in the two-hour pilot for NBC's revival of Alfred Hitchcock Presents. Airing on May 5, 1985, the segment was written and directed by Fred Walton and stars Annette O'Toole as Stella and Bruce Davison as Nurse Ames. The show is in color, which dampens the suspense, and it includes an unfortunately histrionic performance by Helena Kallianiotes as the housekeeper. The show may be viewed online here. "An Unlocked Window" has been anthologized several times and is not hard to find. The version aired on The Alfred Hitchcock Hour is not currently available online or on DVD in the U.S.
"Ethel Lina White." Contemporary Authors Online, Gale, 2003. 10 June 2017. The FictionMags Index. Web. 10 June 2017. IMDb. IMDb.com. Web. 10 June 2017. "An Unlocked Window." The Alfred Hitchcock Hour. NBC. 15 Feb. 1965. Television. "An Unlocked Window." Alfred Hitchcock Presents. NBC. 5 May 1985. Television. White, Ethel Lina. "An Unlocked Window." 1934. Murder at the Manor. Scottsdale: Poisoned Pen, 2015. 324-44. Print. Wikipedia. Wikimedia Foundation. Web. 10 June 2017. In two weeks: "Death Scene," starring Vera Miles and John Carradine! Great article, Jack. I saw the pilot film for the revival series years ago and I remember that segment being just kind of bland. Color definitely doesn't do it any favors. I haven't read White's story or seen the original episode but your description has peaked my interest. Hopefully I can catch it in syndication because I will surely grow old waiting for Universal to release a region 1 DVD. Thanks, Brian. Keep an eye on MeTV if you get it--they should get to this in the not too distant future. John Kerr also played the victim in one of the earliest COLUMBO episodes, "Dead Weight." It's a very small role, but he's very good in it. I was surprised to see that he was the same guy who was in South Pacific. He was so young and vibrant in that movie and played such a weak, sick character here. John Kerr ultimately left acting and became a full-time attorney. Every once in a while, he'd do a guest bit on TV, almost always as a lawyer. John Kerr would turn up once or twice a season on Streets Of San Francisco, as District Attorney Gerald O'Brien. During Season 5, he actually started to get guest star billing. Of all the things to focus on in this episode, I would not have put John Kerr at the top! Still, his career seems to have been an interesting one. Thanks for the comment! I haven't seen it in quite some time, but in spite of all the other good actors, I remember Louise Latham being especially believable. As you say, she was great in MARNIE too. Dana Wynter makes such a good heroine, the kind who almost always comes out all right, that the ending really throws you. I was surprised that Louise Latham was not much older than Tippi Hedren! Great episode, Jack. Sheer perfection in every department,--and that includes John Kerr! His performance was subtle and intelligent, and he made the most of his bedridden/possibly red herring character. This is suggested just a little in the script. That is really too awful to contemplate. To show how good Louise Latham was in this, watch the remake on Youtube for the awful performance by an actress in the same role! I resisted for years, but I finally broke down and purchased an all region dvd recorder off of ebay for under $40. The next thing I did was purchase all three seasons of the Alfred Hitchcock from England which were Region 2. They were about a little over $20 a piece with free shipping and delivery took 12 days, but it's worth it to finally have all of these episodes in my collection. I'm still in the resistance stage. I have dupe copies I bought from a collector.